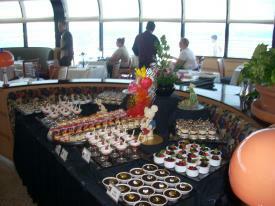 Brunch at Palo�s on the Disney Magic: Everyone 18 or over should do this at least once in their life! Tigger Travels - Family Adventure Journal Photos From Tigger`s Travels and MORE! Everyone 18 or over should do this at least once in their life! Smoked Salmon, Creb Legs, Shrimp to knkock your socks off, Salmon Paste, Cavier and more! On the Disney ships Magic and Wonder there is an adults-only fine-dining restaurant experience that we always find unforgettable. Palo�s is a reservations only restaurant that serves some of the finest food I have ever had with the finest service I have ever had. Before this trip, our Palo�s experience on the Magic was nearly always served by our favorite Annie Marie. She has introduced us to many flavors that neither Jennifer nor I have ever experienced so our affection for her is quite biased. Stohlen Bread, Sweet Rolls, Pastries that all melt in your mouth. When we discovered our favorite was off rotation and not on the ship right now, we were disappointed but we now have a back-up.��Tomas has been quite memorable, too.��Tomas can serve us any time Annie Marie is not available. Eat it first or eat it last... desserts are served in small portions so you can try them all realativly GUILT FREE.... ha! First we started off with a Bellini, a Champaign drink that just whets your whistle. After our tour we were served some kind of alcohol-free Bloody Mary type drink with baby shrimp in it.��Just to warm us up, I guess. 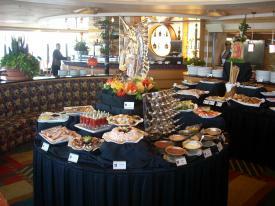 At the buffet I filled my plate with Caviar, Scallops (biggest most beautiful ever! ), shrimp (always good), a salmon Mousse that proved to be delicious and a selection of melon wrapped in proshutto (yah� how do you spell it?). 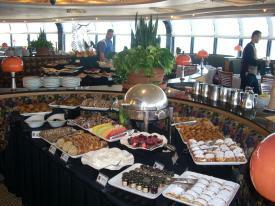 There aught to be a law against displaying food this good! 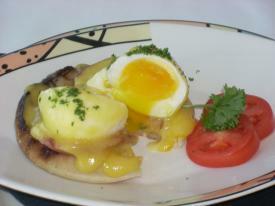 I have had Eggs Benedict many places and many time, this was easily the absolute BEST!!! While were feasting on that plate full I was served the most perfect Eggs Benedict I have ever experienced.��Now mind you, I have had this dish in different places before but never realized that I have never had a perfect one before now.��The presentation was a work of art that I did not want to destroy.��I would love to find out how they got that egg so perfectly shaped. Next came a pepperoni pizza on a very thin crisp crust that was the perfect mix of cheese and sauce. For desert you will find a wide selection of small servings.��This is designed so that you can try more types of desert with less guilt.��I had a great Tiramisu (that is always a favorite) and the ships best sticky bun (or cinnamon roll). 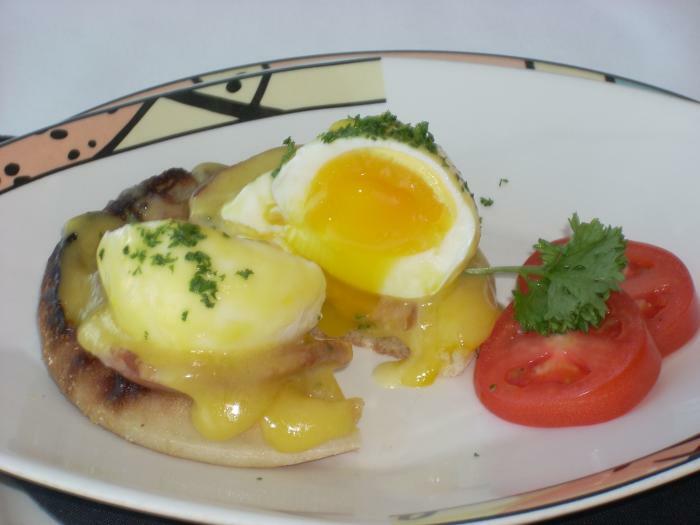 One important note about any meal at Palo�s: PACE YOURSELF! It is so easy to over-indulge in this place.��Take your time and enjoy the foods there.��It is guaranteed to be memorable!